Over the weekend, renowned corporate and political figures paid tribute to late Hanjin Group Chairman Cho Yang-ho, who died of a chronic illness last week. However, his younger brothers Cho Nam-ho and Cho Jung-ho garnered more attention due to their strained relations in the past. Another brother, Cho Soo-ho, former chairman of Hanjin Shipping, died in 2006. Nam-ho is the former chairman of Hanjin Heavy Industries, while the youngest Jung-ho is current chairman of Meritz Financial Group. The siblings had a bitter dispute over managerial rights of the nation’s 14th-largest conglomerate Hanjin Group after their father Cho Choong-hoon, founder of the transport empire, died in 2002. The four Cho brothers had harsh legal battles, with Yang-ho’s younger brothers questioning the legitimacy of their father’s will, claiming it was manipulated in his favor. While Yang-ho inherited Hanjin Group along with the group’s cash cow Korean Air, Nam-ho and Soo-ho, took control of Hanjin Heavy Industries and Hanjin Shipping, respectively, which later went bankrupt. Both the brothers didn’t talk to local media, but they expressed their grief and sorrow. On Saturday, Korean business tycoons and officials from the global aviation industry came to pay their tributes. 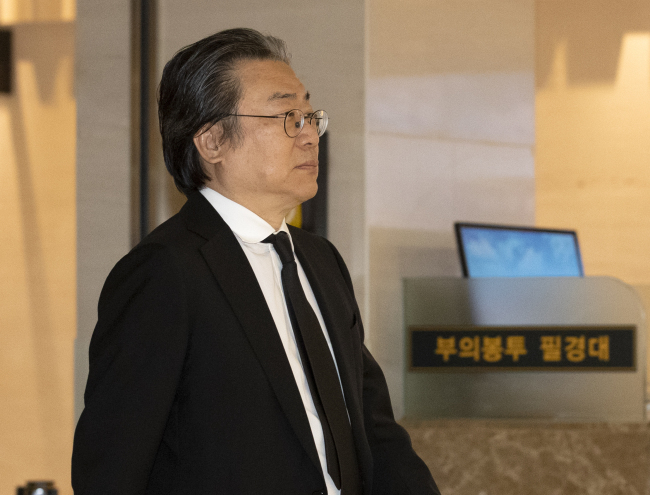 Lee Jae-yong, vice chairman and heir of Samsung Electronics, made a 10-minute visit to the funeral early in the morning. He declined to comment on his relations with the late Hanjin chairman. Michael Wisbrun, head of Sky Team, a global airline alliance of 19 carriers from five continents including Korean Air, arrived at the funeral later in the day. He told reporters that Cho’s leadership over the past 20 years has made what Sky Team is today, expressing deep sorrow and condolences.